Shuho Sugita was born in Shimozuki and was brought up in Yokohama, Japan. He inherited his martial arts interest from his father and went into training in early childhood with Master Saito, one of the great masters of the classical martial arts of that time. He received instruction from Master Saito directly in Jujitsu-Kenpo, Hayanawa (quick rope) and JoJitsu (Stick-Art: 128cm/4ft short staff) for several years and was considered a genius at an early age. At the age of thirteen, he received an Honourable Certificate and went on a pilgrimage to many places in search of new masters, receiving further instruction at various dojos including the Kodokan Takehashi dojo, the Shiroken dojo and the Kitoro Kobokan. "The essence of Japanese Martial Art must be formed on the basis of Goryu. Without practising the Goryu a man cannot win overall." In 1947, Shuho Sugita opened the Jishukan Honbu in Yokohama, Japan, and commenced instructing in his own modern jujitsu style, the Jishukan Ryu. Soke Sugita combined the research he had done with medical science, anatomy, dynamics and physiology, and created a modern original style of jujitsu designed as an attack-defence art. 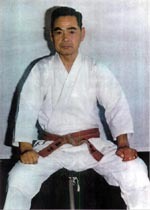 Soke Sugita selected the techniques that best suited the modern times and requirements for self-defence. He excluded the irrelevant and superfluous techniques of the traditional jujitsu styles he had learned (relating to fighting in armour, defence of pre-Meiji era weapons, and so on). The Jishukan Ryu, as taught by Soke Sugita in 1947, combined techniques of Kenpo Karate and Jujitsu, with JoJitsu and Kappo (resuscitation) only taught to Black Belts. It is not meant to be a competitive sport in its complete form but, rather, an effective form of self-defence. Through the constant development of these lethal skills, students begin to appreciate how fragile life is and, in turn, develop strong morals and self-control. The motto of the style is "Be master of yourself", which directly echoes the translation of Jishukan (the school for personal development). A permanent committee, consisting of Soke Sugita and Shihans Okamoto, Yano, Yamanaka and Kanihira, manned the Jishukan Ryu until Soke Sugita's retirement. Soke Sugita retired from active instruction in the 1980s and worked in the Jishukan clinic, practising shiatsu and providing medical care, taught to him by his father since childhood, to his students. Soke Sugita passed away in 1983.